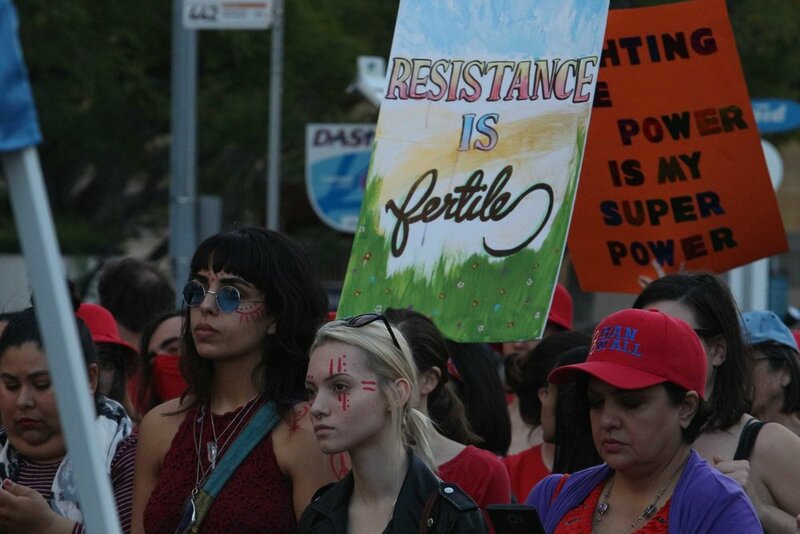 Jonelle Mazell, 25, came to Downtown LA in show of her support for anyone who was not able to attend the rally. Mazell received the day off from work to go to the rally. She is one of two women on her team at work. “I think that it’s important that if you are able to use your voice to use it,” said Mazell. 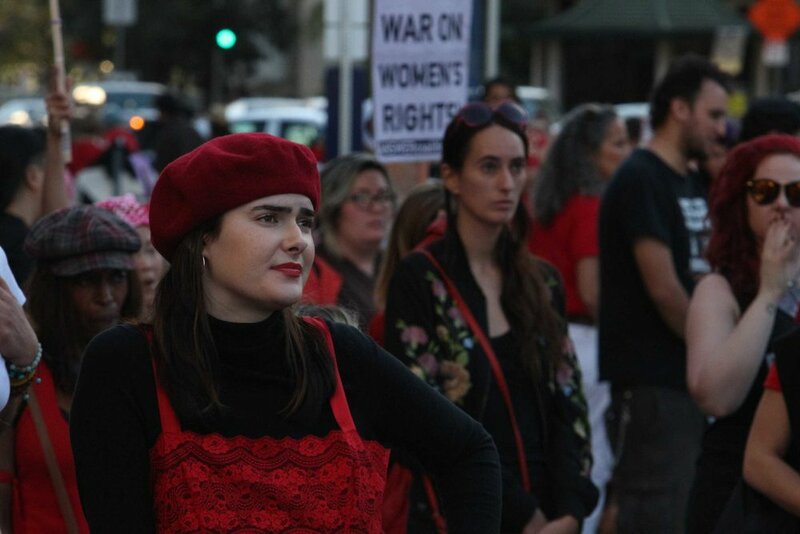 Many women took the day off work, wore red to show their support, and were encouraged to only spend money at women and minority owned businesses or refrain from any purchases throughout the day. Doing this would help raise awareness about the pay gap, discrimination women experience in the work place, and the impact women have on society. 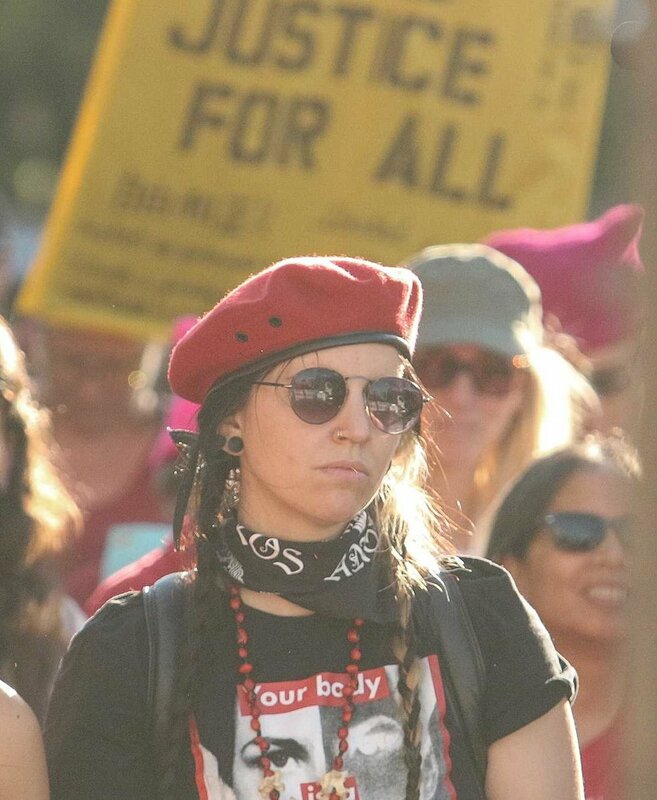 Christine Augustine, 25, Los Angeles, accompanied Mazell at the rally, and came to support women. Augustine works weekends and would generally miss other marches or protests due to conflicting work schedules. “I’m here today because sometimes I can’t always go to the women’s marches because they are on weekends and I work weekends. And today is my day off so I have the privilege of coming here. And I know so many of my friends, sisters, and brothers can’t come out today because they have commitments with work and school. So, it’s definitely important for me to come out today,” said Augustine. According to the United States Department of Labor, women make up 47% of the U.S. labor force. Of that 47%, 73% of women are full-time and 27% of women are part-time. Santa Monica College Student, Manny Portugal, 20, believed that the demonstration was very selective. “The main people who knew about this 'Day Without a Woman' rally and march are white women, and most people who are participating are white women. Meaning that they’re the ones caring about the problem because most of them already have well-paying jobs, so they could afford to lose the day. Keep in mind that someone working from check to check can’t afford to miss one day,” Portugal said. Portugal couldn’t attend the demonstration because of school, and still wouldn’t have attended if he could. He attended the women’s march the day after President Trump was elected. Although he believes the cause is good and is for women rights, he doesn’t see the organization following up with the momentum. Although he also believes that the rally was selective and privileged, he is not against the movement and believes that there must be more than protests and demonstrations. The Women’s March LA foundation will be having another public event on May 1, 2017. This event will be a celebration of democracy and a fight for equality.